Dark Souls 2's Bosses Can Be Beaten Early "If You're Good"
Dark Souls 2 will restructure areas so that bosses can be met and beaten earlier. One of the hallmarks of Dark Souls (and Demon's Souls, if that was your starting point) is its difficult bosses. They're the sort of baddies that seem to be made just to knock you down a peg. You'll have fought your way through an area and be feeling good about yourself just to get slaughtered in the first few seconds of a boss encounter. 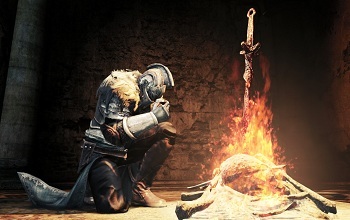 That being the case, developer Takeshi Miyazoe, speaking about Dark Souls 2, has shared that the new game will feature bosses that change things up a bit and can even be defeated early "if you're good enough." These bosses will derive from efforts to change the way the game as a whole is structured. In previous Souls titles, bosses were often used as gatekeepers blocking off new areas. With the next game the developers want to alter that paradigm. "You won't have to start from one venue, go through to the end, beat the boss and then start from a new venue," said Miyazoe. "There will be areas where you can meet the boss halfway. If you're good enough or paying enough attention, you might be able to defeat them early." He added, "We're trying to create a more interactive gameplay flow so that we sort of break a little bit in terms of the traditional 'start point, boss and then new start point'." As with every mention of change in Dark Souls 2, the ability to beat or circumvent a boss early could raise concerns about the game's difficulty, an arguably key element of the Dark Souls experience. Miyazoe assures gamers however, that it will include "key enemies and bosses in the game that will challenge the players enough." Players eager to find out just how challenging the game really is can register for a chance to play the Dark Souls 2 beta, which will launch on October 12th with a second round slated for October 27th.